Imagine your little one, dressed all in pale white, with the stoic wisdom and mythological background of a Greek God. We have many types of costumes, our Greek selection remains a timeless favorite. 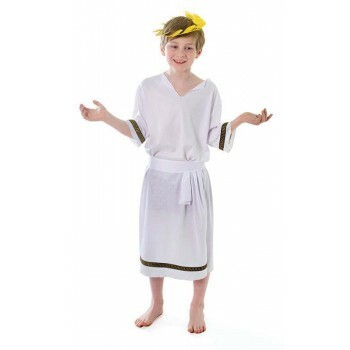 Our offerings here at boys Greek fancy dress ideas include a classic, the boys Ancient Greek Outfit in White. This spunky outfit reads little Greek god and little Greek scholar. The top is a sleeveless tunic style garment with knee length skirt that grazes the knee. Bright canary yellow is the shade of the knit fabric belt tied about the waist. Bright yellow also adorns the sash that drapes diagonally across the chest. 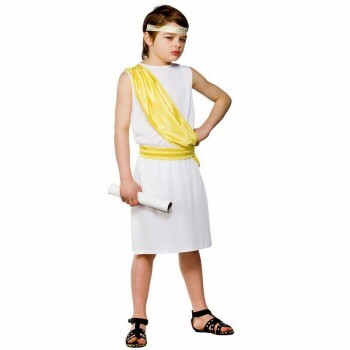 A headband compliments the ensemble- a scroll for the little learner is also available at boys greek fancy dress ideas. 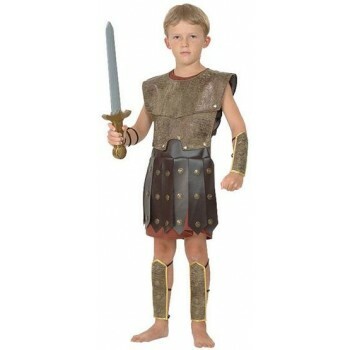 We offer another variation in the Warrior Costume as well.